At the Nationals in 2001 the Wave Class approved a move to set up a schedule of regattas to make up a National Championship Series and National Ranking System. Also, at each Nationals we will have an award for "Skipper of the Year for Open, Women, Youth & Masters." *Points are accumulated with high-point scoring system. In any given regatta, your score would be based on the number of boats you beat, plus one. 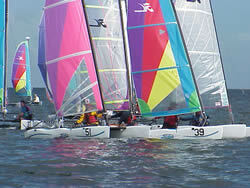 For example, if you attended a regatta with 22 boats and you won, your score for that regatta would be 22. * The Nationals and North Americans will count as two separate races. Thus if you were 30th and there were 70 boats, you would accumulate two races at once and your score for each regatta would be 40. * Your score will be based on your best 5 regattas for the year. * Scoring of boats will be based on boats registered.